As Orthodox Christians, we must strive to love the Lord our God with all our heart, soul, strength and mind (c.f. Luke 10:27) — in other words, with our entire being. The cultivation of the love of God in the mind consists in large part of studying the faith. We must immerse ourselves in the Holy Scriptures and in the teachings of the Holy Church. We must order our lives so that — if it is possible — the majority of the impressions that form our way of thinking come from our Lord's teaching, and not from the corrupt teachings of this world. This is why it is so important to prayerfully read the Holy Scriptures under the guidance of the Church. This is also why, for those who are academically minded, higher education in theology is valuable. This is not just for those who want to become priests; all of us can benefit from better knowing our faith. Through study we can be brought to love God more fully, and we can also be able to better answer the questions those around us who are starving for the enlightenment that only Jesus Christ can bring. 1. The Pastoral School of the Diocese of Chicago and Mid-America is a ministry of our own diocese. It consists of online classes that include readings, discussions and examinations. There is a track for future priests and deacons and another track for those who wish simply to learn more about their faith. This year, the pastoral school is offering summer courses to all who are interested. 2. Holy Trinity Seminary in Jordanville, NY offers a correspondence course leading to an accredited Certificate in Theological Studies (HEGIS 5623). Students are sent a reading list, and go to Jordanville for examinations twice each year. 3. The newly-formed St. Cyril and Athanasius Institute is a ministry of the Western American diocese. This is an innovative online program consisting of modules of study in an interactive online format. This selection tells of two things: Jesus' washing of His disciples feet and His knowledge of Judas' betrayal. 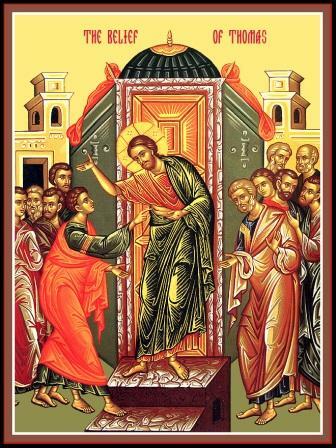 "When the glorious disciples were enlightened at the washing of the feet, then Judas the ungodly one was stricken and darkened by the love of silver…" (Troparion for Holy Thursday and Friday). The way of Jesus Christ and the way of the world are completely different. "“You know that the rulers of the Gentiles lord it over them, and those who are great exercise authority over them. Yet it shall not be so among you; but whoever desires to become great among you, let him be your servant. And whoever desires to be first among you, let him be your slave— just as the Son of Man did not come to be served, but to serve, and to give His life a ransom for many.” (Matthew 20:24-28). Our Lord is teaching this when He washes the disciples' feet: "If I then, your Lord and Teacher, have washed your feet, you also ought to wash one another’s feet. For I have given you an example, that you should do as I have done to you" (John 13:14-15)." The disciples are enlightened, but Judas is "stricken and darkened". An encounter with God does not leave us unchanged. We see this throughout St. John's Gospel, but especially here. When we meet God and see Who He Is, when He reveals Himself to us, then we either love Him or we reject Him. This is how it will be on the last day when He appears in the clouds with great glory. Will we love Him more than money, than our pride, than earthly glory or pleasure? It depends on the baby steps that we take now. He reveals Himself to us now in measure, a little bit here and a little bit there, just enough so that it is in our power to choose to accept Him and follow His way. And in that way, we can learn to love Him more. So let us heed His injunction to wash one another's feet as He has shown us, that we might be stricken with the love of our Lord and God, rather than with the love of corruptible earthly things. "I am the Son of God." "…the Father is in Me, and I in Him." What do we mean when we say the Jesus is God, that He is the Only-Begotten Son of God, of one essence with the Father? Jesus Christ is GOD, the Creator of all that exists. He made us, He redeemed us, and in Him we have our life. He is not optional. He is not "one path up the mountain to God". Nobody can know the Father apart from Him, for the Father is in Him, and He in the Father. Let us worship Him and follow Him in everything. The sheep follow him: for they know his voice. "The door" is the Holy Scriptures, the Bible. Blessed Theophylact, following the interpretation of St. John Chrysostom, explains this to us. Jesus Christ Himself, the Son and Word of God, is also "the door", as He tells us a few verses later. It is only by Him that we can enter and be saved. He is also the Good Shepherd, who enters by "the door" of the Holy Scriptures, since they testify to Him. Indeed, the whole Bible is about Jesus Christ. Everybody else speaks of himself, and twists the Scriptures to fit his ideas. So how is it that we can be saved, and "go in and out, and find pasture"? Through Jesus Christ. And how is it that we will recognize Him? Because He will "call us by name," and if we will "know His voice". And how will we know His voice? Because we will have, throughout our lives, accustomed ourselves to hear and love His voice. And how do we accustom ourselves to hear and love His voice? By reading the Holy Scriptures, by praying in the words of the saints, by attentively praying in the services of the Church, by frequently receiving the Holy Mysteries, and by striving to follow His directions about how to live, knowing that He will not lead us astray but will rather guide us into the good pasture. Sometimes the order in which we pray also teaches us important things. Our services and prayer books are comprehensive and teach us every way we should approach God in prayer. They are full of dogmatic truths and compunctionate sayings and prayers to the martyrs, especially in the weekday Matins services. I was struck about even the order in which our prayers are said in Matins when I was singing (I am using the term loosely) the praises for Monday of the week of the Myrhhbearers. The first sticheron was about the resurrection, the next was a compunctionate one, and the next was an ode to the martyrs. How sensible this is! 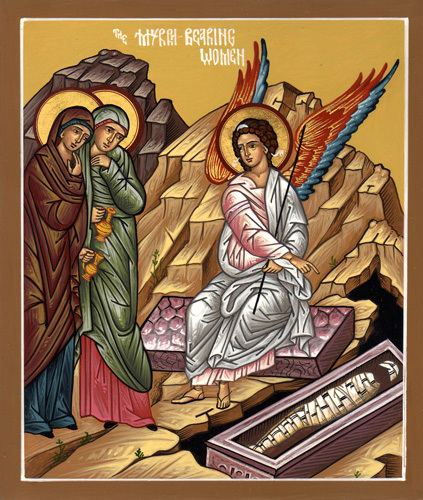 Without the Resurrection we are nothing; our life is because of the Resurrection. Thinking of the Resurrection should also make us think of how we do not live according to the resurrection. Of course we should feel compunctionate about this. I love how easily and naturally we mix thoughts and prayers of praise and dogmatic theology with compunction. We never get ahead of ourselves; we always remember what we are like even when we are not looking at a mirror[i]. Of course the ones who lived the resurrection to the fullest are those who died for it: the martyrs, and so we pray to the martyrs following the compunctionate sticheron. If one prays the services of the church, a rhythm is felt, as natural and easy as breathing. In so doing, our character is changed, and we naturally think like God. Of course, this is the process of salvation; we acquire the Mind of Christ[ii]. Every time I pray the services, especially if I am alone in the quiet, I feel this mind and the excitement that in learning to pray, I am acquiring it. Save your pennies and buy the service books and pray with them. Our typicon and order of the services is complicated and daunting, but so is sin. Praying them becomes second nature, as they teach us to live in accordance with God's nature. 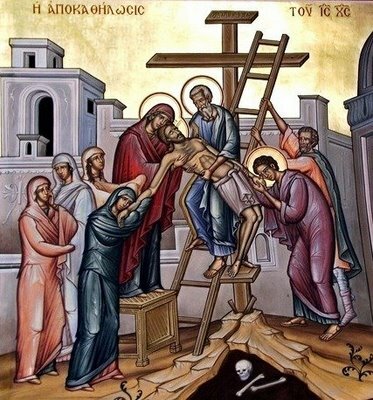 Of the resurrection: Every breath, all creation, glorifieth Thee, Lord, in that Thou didst abolish death by Thy cross, that Thou mightiest show the peoples Thy resurrection from the dead, in that that Thou alone lovest mankind. Of compunction: Mindful of the unseemly sins I have committed, I flee to Thy compassions, imitating the publican, the harlot who wept, and the prodigal son; wherefore, I fall down before Thee O Merciful One, and say: before Thou condemnest me, O God have pity and mercy upon me! Martyricon: Ye suffered for Christ even unto death, O passion-bearers and martyrs. And though your souls are in the heavens, in the hand of God, your relics are venerated throughout the whole world. The priests and the people all bow down; and we cry out, be rejoicing: precious in the sight of the Lord is the death of His saints. PS. Did you notice the number of allusions to Scripture in these 3 hymns? I count at least 10. I would love to see them in the comments. [i] James 1:23-24 For if any be a hearer of the word, and not a doer, he is like unto a man beholding his natural face in a glass: (24) For he beholdeth himself, and goeth his way, and straightway forgetteth what manner of man he was. 1Corithians 2:16 For who hath known the mind of the Lord, that he may instruct him? But we have the mind of Christ. Ephesians 4:23-24 And be renewed in the spirit of your mind; (24) And that ye put on the new man, which after God is created in righteousness and true holiness. Philippians 2:5-8 Let this mind be in you, which was also in Christ Jesus: (6) Who, being in the form of God, thought it not robbery to be equal with God: (7) But made himself of no reputation, and took upon him the form of a servant, and was made in the likeness of men: (8) And being found in fashion as a man, he humbled himself, and became obedient unto death, even the death of the cross. Romans 8:26-29 Likewise the Spirit also helpeth our infirmities: for we know not what we should pray for as we ought: but the Spirit itself maketh intercession for us with groanings which cannot be uttered. (27) And he that searcheth the hearts knoweth what is the mind of the Spirit, because he maketh intercession for the saints according to the will of God. (28) And we know that all things work together for good to them that love God, to them who are the called according to his purpose. (29) For whom he did foreknow, he also did predestinate to be conformed to the image of his Son, that he might be the firstborn among many brethren. Romans 15:5-6 Now the God of patience and consolation grant you to be likeminded one toward another according to Christ Jesus: (6) That ye may with one mind and one mouth glorify God, even the Father of our Lord Jesus Christ. If we understand faith to mean that we believe and live according to what we believe, and that faith and works cannot be separated, than I will agree that we can be saved by faith alone. However, The Holy Apostle makes a distinction between "faith" – that is – to espouse a belief in something, and "works" – to live according to faith. Christians have always understood the faith to be believing in God, and acting upon that belief. Only at the time of the Reformation was the terrible heresy of "Faith by works alone" concocted by the mind of Satan and distributed to those who value human reason too highly. This is a terrible tragedy for the soul, and I have seen people lost to the church because they could not grok this concept. It matters what you believe and it matters what you do! Let us work out our salvation with fear and trembling, always with confidence that God will fill our infirm vessel with grace, and magnify our feeble but sincere efforts. You are currently browsing the Saint Nicholas Orthodox Church blog archives for May, 2013.